Launchpad Where all good (and bad) ideas start. This is the Launchpad, where you can develop your small ideas, recruit help and form teams. November 21st, 2009 (1:18 PM). Edited November 21st, 2009 by Chaos Rush. Well, Pokemon FireRed/LeafGreen always has been bugging me since there's so many features it lacks which makes it inferior to the Hoenn games. Now if you check my old thread, "The True Pokemon Saga", you'll notice that I was working on a FireRed hack. I am no longer doing that, instead I am currently hacking Pokemon Emerald, re-creating a the Kanto region, with it's size equal to that of HeartGold/SoulSilver's Kanto. 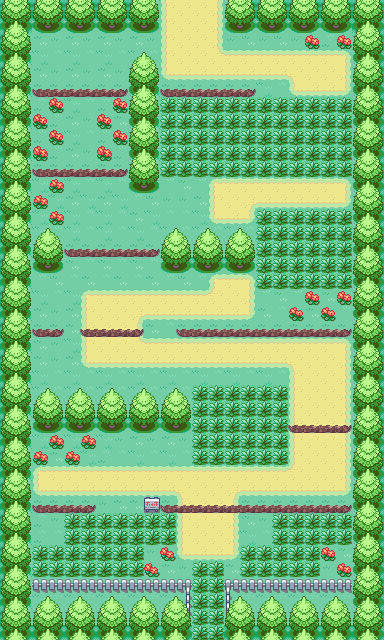 The reason why I'm not changing the Emerald trees is because they look like the Kanto trees in HG/SS. I no longer consider those "Hoenn trees", because I'm also doing another hack of Emerald that simply turns Hoenn into a more tropical place (like the Battle Zone from Platinum). Progress on this has been rather slow, so don't expect a beta for a while. Basically, this whole thing is to recreate FireRed/LeafGreen the way it should have been, and make it equal to that of Emerald version. In order to do that, that's why I'm choosing to hack Emerald instead of FireRed, because Emerald has the Real-Time Clock, the Battle Frontier, and animations. November 21st, 2009 (3:42 PM). I'm currently up for hire, for almost anything in ROM hacking, so just send me a PM. November 21st, 2009 (5:34 PM). That's kinda what I was trying to do. Emerald and Amethyst are both jewels. By doing this hack, I'm pretending that Pokemon FireRed/LeafGreen never existed, and so the four canon games to me (Emerald, ShadowAmethyst, Platinum, and HeartGold) have to have "consistent" names. And so, the first game of each "saga", would be Emerald and Platinum, one word. The second game of each "saga" would be ShadowAmethyst and HeartGold (Yes I'm going to hack HeartGold in the future. All I'll do is change the Pokedex and edit trainer teams and fix the goddamn low levels). And because of that, I think ShadowAmethyst goes along better with Emerald than RainBlue. I mean, which sounds more epic? November 22nd, 2009 (8:26 AM). Anyway...there is no storyline since this is going for a remake, I guess...but maybe you should add your own touch in this remake. November 22nd, 2009 (8:38 AM). If this is just the 3rd game in a series, should (not saying HAS to, saying it should, but not necessarily) really have the 3rd thing, and not a random stone. Anyway, this is just what FR/LG SHOULD have been like, right? On Emerald... Interesting. People have wanted to port 1 game to another, but never completely achieved... Good luck. November 22nd, 2009 (9:15 AM). Yeah, this looks good, but when i saw the name, i thought it'd be one of these hacks with 3 lines of storyline. Besides, Amethyst alrady exists. November 22nd, 2009 (9:42 AM). It shouldn't be hard. Because FR/LG doesn't have any epic mega scripts like R/S/E did. And everything I need is already in Emerald, such as the Battle Frontier and the PokeNav. And this is why I am not going to have the name Red or Blue (or Green) in the title: The mascot of this game is Mewtwo, not Venusaur/Charizard/Blastoise. It's not really the third game. You see, I want to perfect 4 different games of each region, and they are Emerald, ShadowAmethyst, Platinum, and HeartGold. I'm already done hacking Emerald and Platinum, and so by doing this I'm pretending that Ruby/Sapphire, FireRed/LeafGreen, Diamond/Pearl, and SoulSilver never existed. November 29th, 2009 (8:05 PM). Not really an update, but I'm still working on this. Anyways, I realize I haven't said anything about the plot, and basically it's gonna be different from FireRed/LeafGreen. *Expanded Team Rocket plot. The plot no longer ends at Silph Co., the Soul Tower in Lavender Town now has extra floors that are inaccessible until you have 7 badges. You cannot enter the Viridian City Gym until you have visited these floors. This is where the climax of the Team Rocket plot will take place. *Kanto Pokedex now has 202 Pokemon. It contains the original 151 Pokemon, all of the Generation II evolutions/pre-evolutions to the Generation I Pokemon, such as Pichu, Crobat, Kingdra, etc. It also contains most of the Johto Pokemon that are present in the Hoenn Dex, such as Donphan, Xatu, and Girafarig. It also contains some random Johto Pokemon to fill the rest of the spaces. Azurill and Deoxys are the only Generation III Pokemon in the revised Kanto Dex. *All Gym Leaders have significantly improved teams. Giovanni: Er...sorry I forgot at the moment. Will edit later. *I'm not gonna reveal teams, but I'll say this: There is a new Elite Four member, and a new Champion. Your rival is no longer the Champion, so I thought it would be more fitting to make Lance the Champion. Also, the new Elite Four member IS NOT a fan-character. *Even though all of FR/LG's songs are programmed into Emerald, I will be modifying them instead of directly using FR/LG's. I will be changing the key of those songs back to the way they were in R/B/Y. For instance, Cerulean City's theme in R/B/Y was in the Key of E. In FR/LG, it was changed to F, and it sounded terrible. I've changed it back to the key of E.
*Yes, I've re-inserting all the FR/LG sprites into the Emerald ROM. For Frame 2, I'll be using the R/S/E Frame 1 sprite, or for some Pokemon I'll be using a custom sprite. I'll edit this post later with screenshots of what I've done. November 30th, 2009 (12:06 PM). December 12th, 2009 (3:51 AM). How about Pokemon Brilliant Blue. December 13th, 2009 (10:30 AM). The mascot is Mewtwo. Mewtwo isn't blue. Anyways, don't expect to see anything until I post in the progressing hacks section. Also what I posted earlier, not all of it will be like that. I've redone Gym Leader teams again, and re-thought some features. I don't want to say much more, just wait in a few weeks (or more) when I post in the Progressing Hacks section. I'll post it when I'm almost done with the first beta, which will go all the way up to Pewter City. May 31st, 2014 (9:44 PM). It's been 5 years since someone posted something, am I in the wrong thread? I recently saw that Chaos Rush cancelled production of my favorite Pokemon hack, Dark Violet, near the end of the thread I was informed that a new re-boot of the game would be made called Pokemon amethyst, naturally I looked it up and found Chaos rush and this thread but...is there another thread for this game or has it not been created yet? May 31st, 2014 (11:03 PM). You're in the wrong thread. I don't believe a new thread has been posted, but if you'd like more information the only thing you could so is message the creator. I'm going to close this thread now since it's been dead for years.